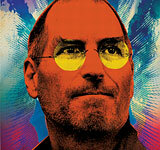 John Heilemann’s big piece on Steve Jobs, Apple, and iPhone is in this week’s NY Magazine. I don’t know if Apple has peaked, that’s a tough call, but I do think John is raising the bear case on AAPL to a new level. I’m quoted briefly, singing the praises of streaming music, which will be no surprise to anyone who reads this blog frequently. I am also long AAPL and not yet convinced to sell the stock.